Raise your hand if you love breakfast for dinner. It is one of my kids' favorites. We usually have it when Brandon is out of town, because is is not at the top of his list of good dinners. 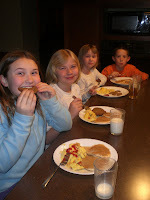 I love it because it is easy, fast, and all 4 kids cheer for joy when I say we are having breakfast for dinner. So today, I am just curious how many of your families enjoy this as well. And can your kids say pancakes, or do they say "patapakes" like Ethan & Lily?